Hired HD Video Production for shooting an episode featured on Russian main TV channel (ORT-1) TV show “Wait for me”. We needed footage in Seattle, including territorial and street views along with the interviews. Despite the short deadline, HD Video Production carried out the task promptly on time. We are fully satisfied with the video and look forward to continuing collaboration with HD Video Production in the future. Fast, Efficient, Great Product, Easy to work with! Great Job! Steadicam work is like an Art (both: an “aesthetic art” of continuously shifting/dancing frames plus focus & a “martial art” of movement while capturing the video). It took me months to design and tune all necessary accessories and then a lot of practice for learning how to keep the frames stable and uniformly moving. It is extremely engrossing to observe a real Steadicam Master in action! Some of them are using an assistant for walking them around (like a guiding man for the blind). 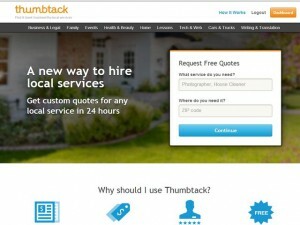 We are very pleased to collaborate with Thumbtack. It’s a convenient internet-based network that facilitates connection between customers and local businesses. The service is simple, optimizes flexibility and precision matching, fast, easy to use and very well professionally implemented.